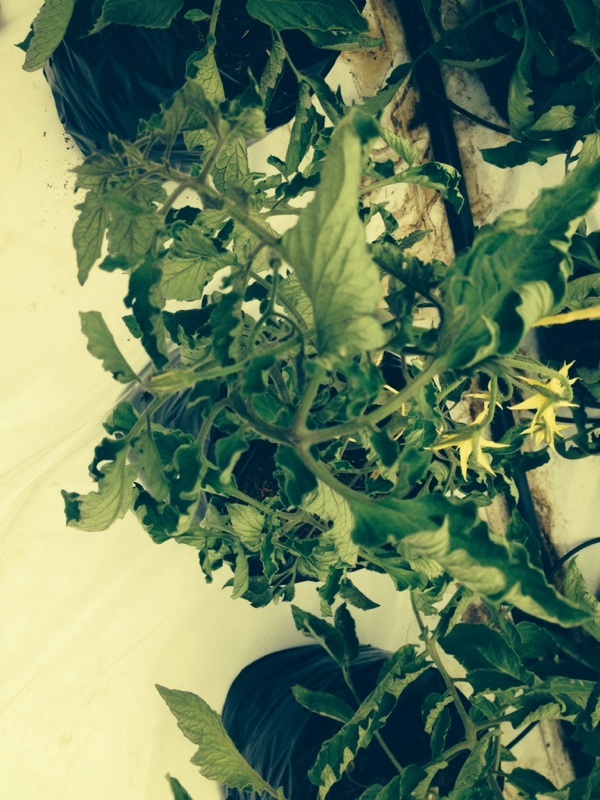 This appears to be stem rot, which is usually caused by too much water and/or poor drainage. 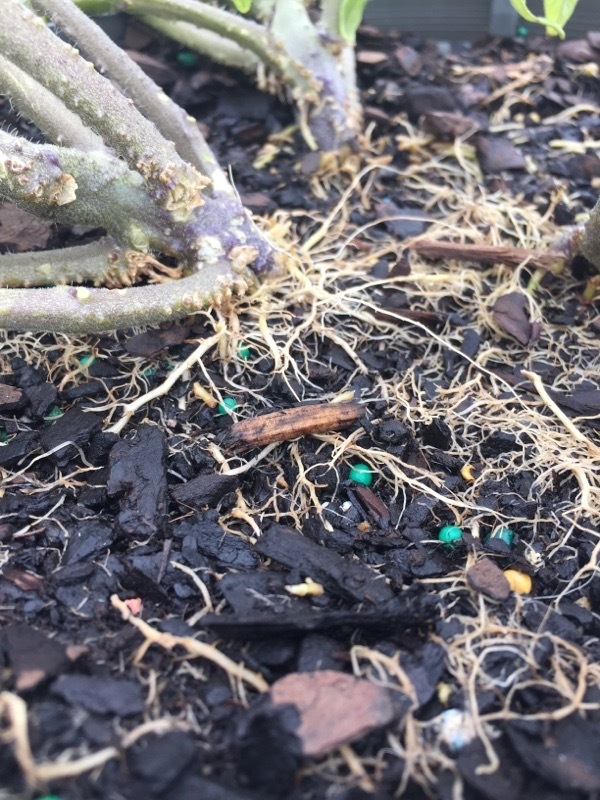 In your photo we see mulch right up against the stem; this can cause stem rot because moisture is being kept in contact with the stem by the mulch. Your plant appears to be doing ok from what we can see of it, so we recommend moving the mulch back from around the stem about 3-4 inches and don't apply water right at the stem. Apply the water about 3-4 inches away from the stem (this is usually where most of the roots are developing on young plants, so it provided water at the appropriate location. 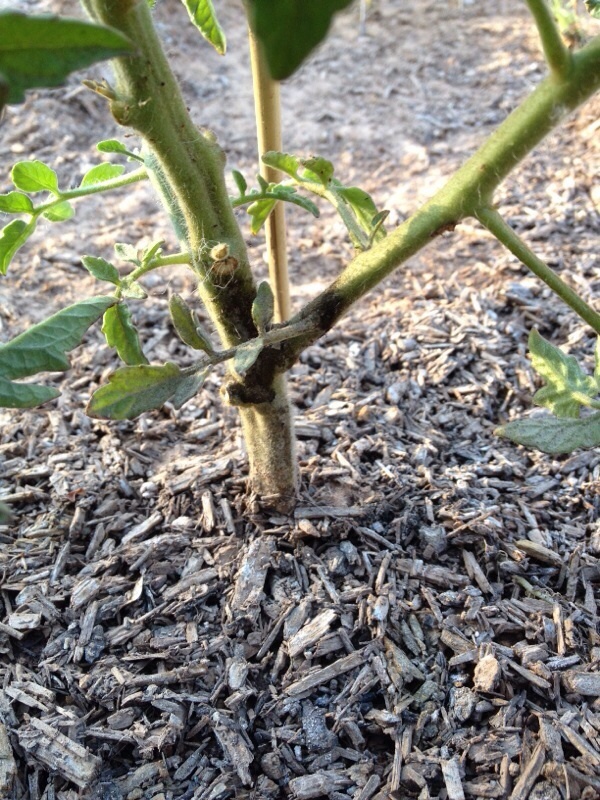 You cannot reverse stem rot, but it may not progress if you remove the mulch as we suggest. There are not "products" that can cure this, its a matter of environment. Not to worry these are just leaf miners. A tiny fly visited your plant last week and deposited a single egg between the upper and lower leaf surface. The egg has hatched and turned into a hungry little worm which is eating all of the good stuff inside. First of all -- they will not effect the quality of quantity of the tomatoes. They don't bother the fruit and they're so small the plant can still produce tomatoes with a few leaf miners eating their way through your leaves. It's okay. The easiest way to get rid of them is to simply remove the leaf and throw it away. You can also squish the little worm inside by squeezing the entire leaf between your thumb and forefinger a couple of times -- ugh :( Or, you can just leave him alone. It's not hurting anything. This is puzzling. Do you see anything on the leaves? Doesn't look like insect damage or sun scald. If there is erratic weather from hot to cold or irregular watering, this could also lead to die-back of branches. And there was a heat wave this week. This website may help you figure it out. 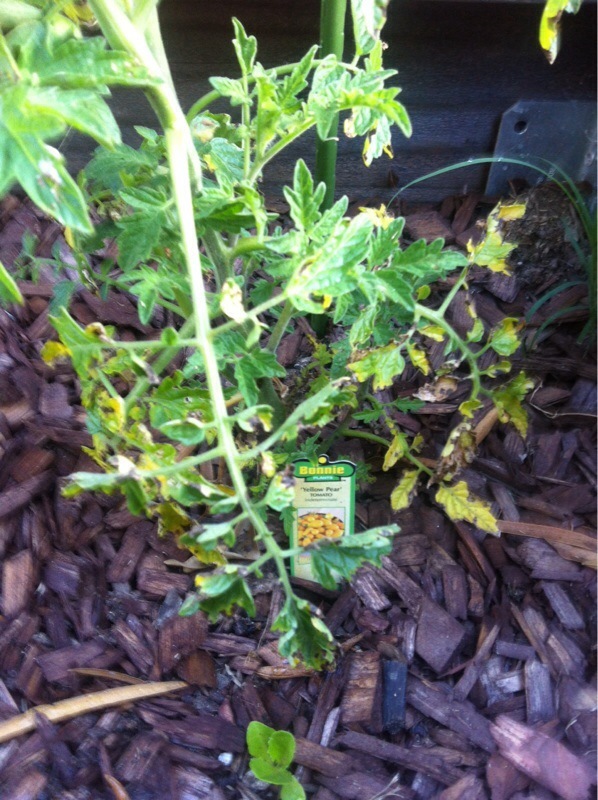 http://www.ipm.ucdavis.edu/PMG/GARDEN/VEGES/tomato.html. You could also take a sample to a local nursery for identification of the problem. Also suggest you clear the bark from the main stem of the plant so that the bark is not directly up against the stem where excess moisture may build up leading to disease. Feed with a slow-release or organic fertilizer formulated for tomatoes and supplement with a liquid organic foliar feed such as liquid kelp. Tomatoes are heavy feeders. 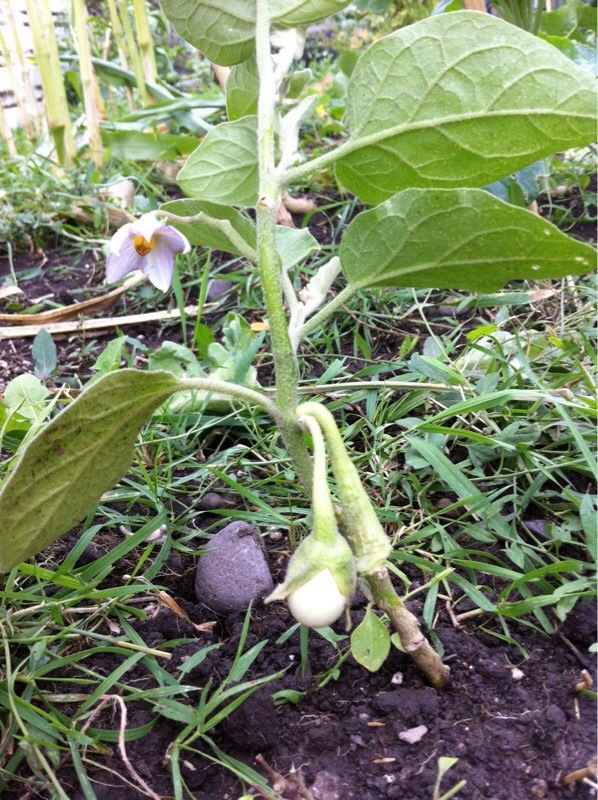 Eggplants are cold-sensitive and require a long warm season for best results. 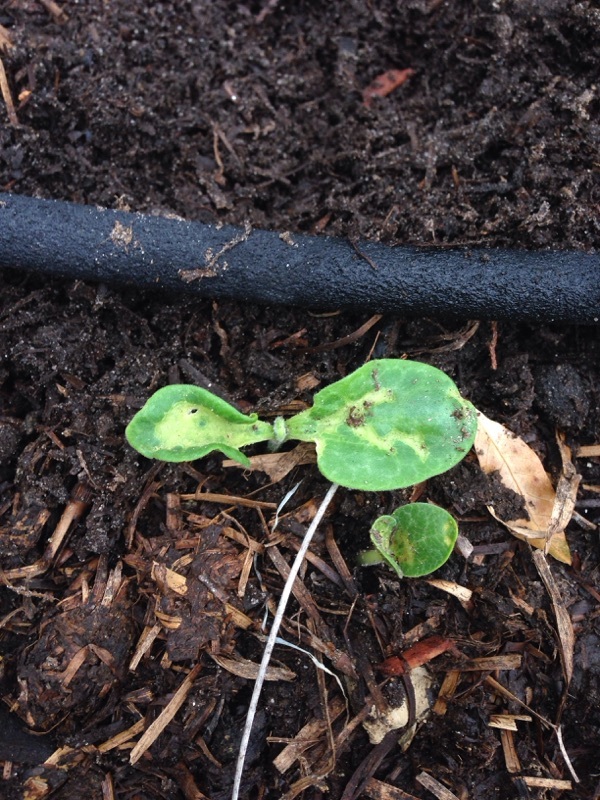 Plant in full sun in fertile, well-drained soil. Do not permit seedlings or young plants to suffer from low temperature or drought. Mulching between plants is useful. Space plants 18 to 24" apart with 30 to 36" between rows. Plants thrive in the heat of summer. These robust-sized plants up to 3' high and almost that wide can have purple-tinged green leaves, drooping violet 1 1/2-inch flowers and depending on the cultivar, fruits from grape to almost football size in white, yellow, red, green, violet or purple. For mature fruits, harvest after some color appears but always while fruits still have their glossy shine. This white variety may be the one sold as 'Casper." There are a variety of things that could cause your watermelon to be small. It could be either underwatered, undernourished, or possibly too mature when you planted them (if you planted seedlings rather than seeds). Vegetables need soil rich in organic matter, which can usually be found in a high quality compost. They also need the right food sources, fertilizers, to meet their needs, plus ample water. 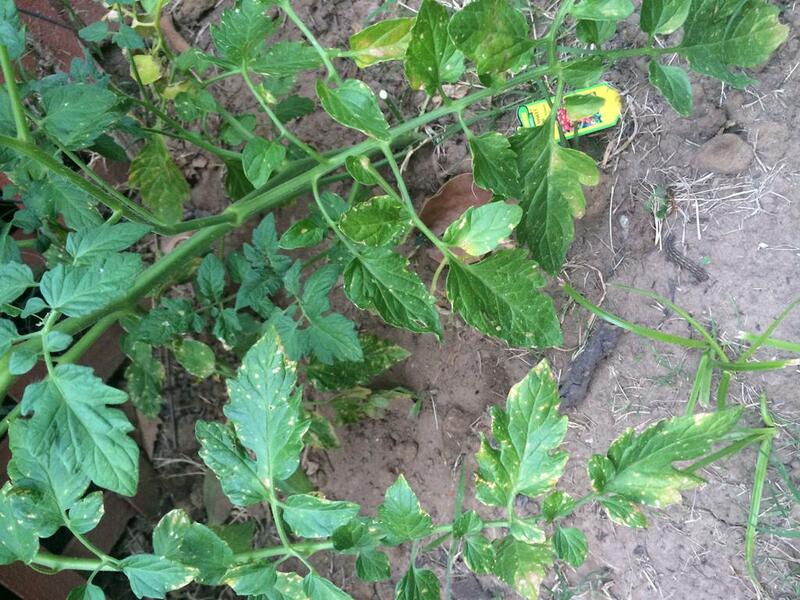 Or, you may have planted a small "icebox" size watermelon in the first place. Varieties that mature quickly (what we need in our short growing season) tend to be smaller. 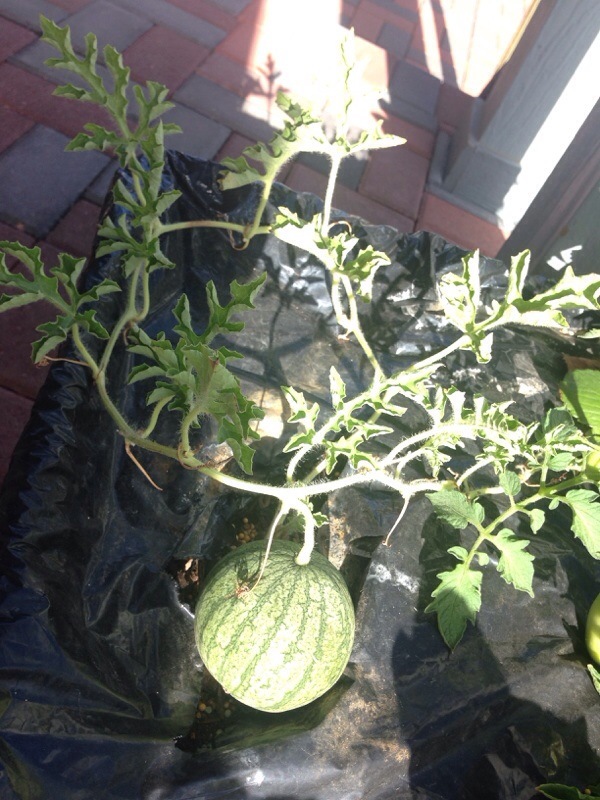 For maximum size, allow just one or two melons to mature per vine and remove the rest. That way the plant will put all its energy into just those few fruit. 2-this plant appears to be in need of the proper nutrients. You might want to consider investing in a high quality fertilizer formulated for vegetables that contains micronutrients. Follow the directions on the label. You would most likely be able to get advice and be able to purchase at your local independent garden center. 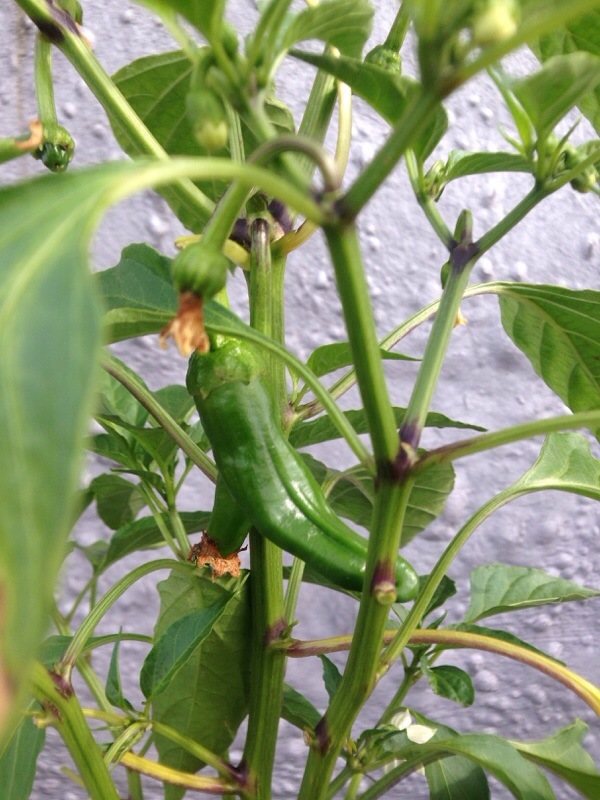 We're sorry but it's not possible to identify a variety of pepper based on the look alone since they all look similar, especially when they are green. Some varieties of the shape shown are spicy while others are not. Some ripen yellow and others red. That's one of the problems with "pass along seeds" is that you get no clear idea of what you're growing and when it will be ripe. The best thing would be to ask the person who gave you the seeds, but if that's not possible, wait and see if the pepper turns yellow or red but pick it before it gets soft. Once you cut it touch only a tiny, tiny bit of it to your tongue to see if it's spicy. Until you know how spicy it is don't get the juices on your fingers since really spicy peppers will burn if you touch the juices to your face etc. 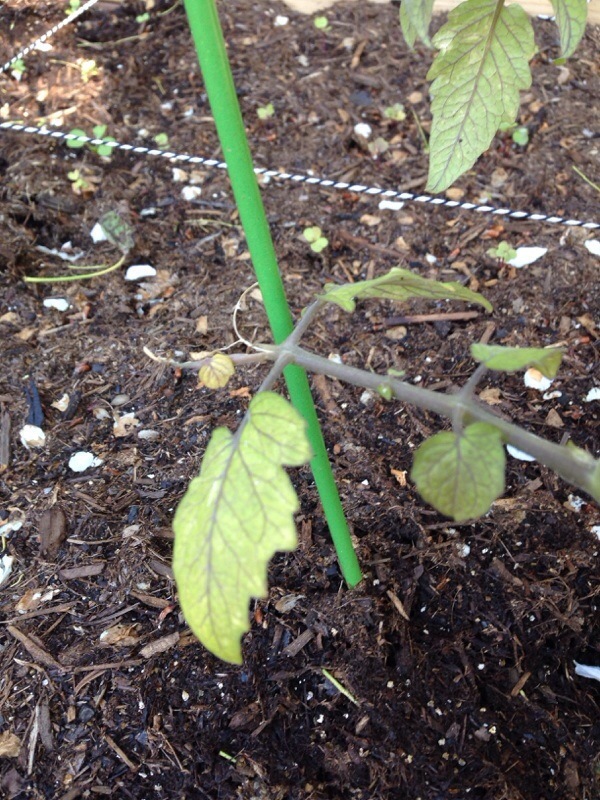 The bumps along your tomato stem are its efforts to send out roots.Tomato plants tend to grow adventitious roots along its stem and that is why tomato gardeners plant them deep to keep the plant sturdy and vigorous. The adventitious roots could also be a reaction to a fungus infestation or irregular water. They tell you there is stress, but are not themselves a problem. The plants look like they are falling over or a large amount of water has passed over them. Are they so full of fruit that they can't stand up? Try thinning the fruit to see if that helps. Transplanting is a good idea but it might send the plant into shock. Perhaps you could try 1 plant to see how it goes. If they are still in the pot, add more soil and try to prop them up. Are you using tomato cages? That might help also. This looks like it could be either insect damage, disease damage, or nutrient deficiency. 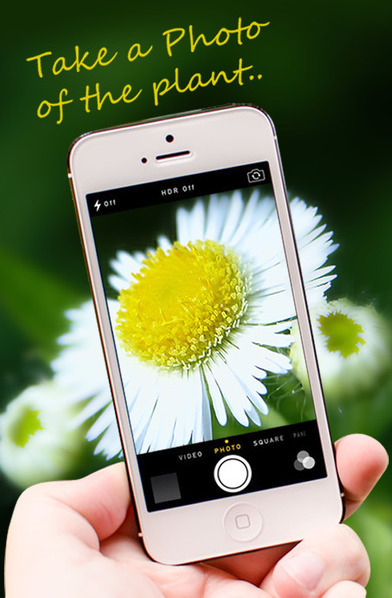 We recommend you use a magnifying lens to look for very small insects, or signs of their presence, (like black tar spots of excrement within the spots) on the reverse side of the yellow spots, or other signs of a fungal disease (like mildew signs). If there is nothing visible, then this could be a different kind of fungal or a bacterial disease, or signs of a nutrient deficiency. In this case we recommend you take a sample (sealed in a bag) to your local garden center for proper ID and control recommendations. Be careful with splashing water on the leaves and do not water over the top of the plants to avoid spreading fungal and bacterial diseases.